These days its wires everywhere, we have our mobile phones and tablets to charge up and each one needs a charger plugged in – sockets become a rarity and to make things worse, we have have two types of USB port, Micro and Mini depending on the device. So the benefits of wireless charging are basically that you can potentially halve the number of ports required by using them. This is not immediately clear – so for example, lets say we have two devices, each with a different charge port type, without a wireless charger you would have to connect them to two separate wires, and in turn, these would typically (although not exclusively always) be connected to two wall sockets. Using a wireless charger, we could charge each device (albeit in turn) and only use one wall socket as long as both are compatible with the charger and both are QI enabled. Charging does tend to be a bit slower with these wireless chargers but if time is not an issue then they are handy. If you place the charger plate in a consistent place, dedicated, then you simply walk over to it and pop the device on it and walk away. There is no need to lean over and fiddle with the cables trying to find the USB port, which, lets face it – is always upside down to the cable connector when we do finally arrive in the right place – especially in the dark corners. As an aside, this generic one actually has a built in light so that you know it is powered on when you come to place your phone on it. Lets take a look at an image of the one under review here. And very pleasant on the eye it is aswell! 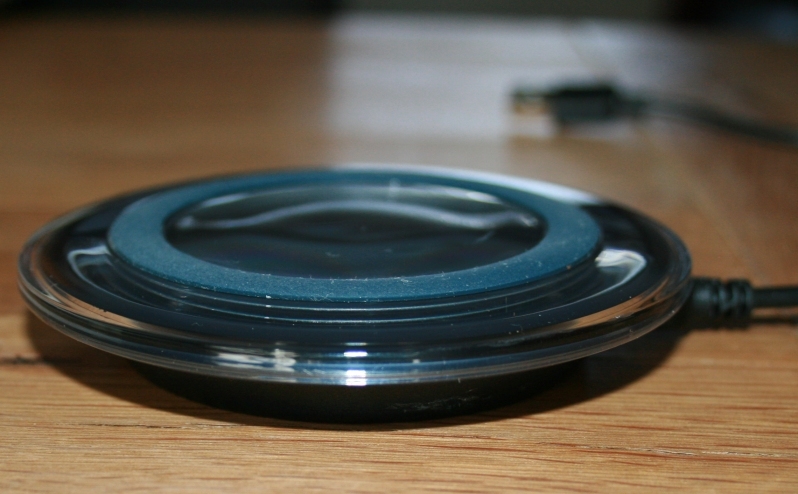 You can see from the image above that the charger is a flat flying saucer shaped disk with a non-slip rubber mounting circle to prevent the device from sliding off whilst on charge. The supply end of the cable is your standard USB connector and this can be plugged into a PC or wall mounted 5v USB connector. It is a shame that many of these USB type of devices do not come with the wall plug these days, I really think they should to be honest because you can get adapters with various subtle differences in the output voltages and this can cause problems, so be sure to use the correct adaptor. How to Connect the Wireless Charger to a Power Source. In my case, I was helped around the problem of having to provide a power source because I already own a Four Port multi charge unit. There are two types of outlet on this, and I selected the correct outlet by matching the Max output of 2.4 amps from the port, to the input requirement for the wireless charger – which is 2amps. Thus I am supplying power from a port which is capable of driving more current than will be needed by the charger. 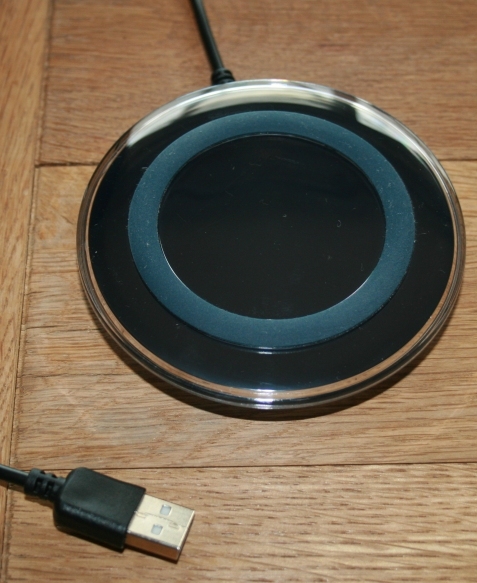 Once the cable is connected to the multi-port, the LED lights appear on the disk of the charger and it is ready to accept the QI enabled device to charge its battery. So you can see by the above – that wireless charging is not really wireless, there is still a need for power to be provided to the unit, but all in all this kind of gadget does help with reducing the number of wires you will need overall – so long as you own QI enabled devices. These contain a foil on the inside which collects the charge – quite how it works in scientific terms is beyond the scope of this review. 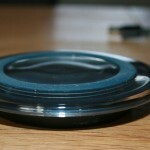 How Slim is the Wireless Phone Charger? Take a look at the photograph below and you will get an idea of how slimline the charger actually is. It really is a stylish bit of kit and takes up hardly any room on the worktop or desk vertically or horizontally (as it is certainly smaller than a mobile). What can be Charged with the Wireless Charger. These, along with compatible tablets which also incorporate the standards and technology can also be charged. I would point out, that as far as I am aware – Apple have gone their own route (they aren’t mentioned on the seller description) – so if you have an Apple device, take care and ask for help choosing the right one. I like the design of this, and I am finding it very handy not to have to mess around with connectors, which incidentally, it’s worth thinking about the fact that they break with overuse or mis-alignment over time – wireless charging overcomes this issue.